WHAT'S NEW ON THIS WEB SITE ???? scroll down to find out. There are also lots of helpful hints on this page. Be sure to scroll all the way to the bottom of this page, and every page so that you don't miss out on something important. There is a lot of navigational help on this page, plus under the photo button above, and under the Table of Content (TOC) button above. 2019 NEWS: The two RV Gypsies are spending time mostly in North Carolina, South Carolina and the surrounding states, mostly on the east coast. Of course this travel plan can change as the year progresses. 2018 NEWS: The two RV Gypsies got the road later than normal in 2018. They spent a lot of time in Florida because of several special family events. And they moved their home base for the RV from Florida to South Carolina. So for this year, most of their travel was in the southeast. 2017 adventures are posted, but here is a 2017 travel summary because events were unusual: The two RV Gypsies took a trip from Florida to Connecticut with several fun stops in between. Then they enjoyed time with family and friends in Connecticut. Then they left Connecticut to get back to Florida for two special birthday parties, and had some fun stops, but along the way their RV needed some repair, so they stayed in hotels in Maryland, until their RV was repaired enough to finish the trip to Florida. Unfortunately, the repairs took longer than expected, and they had to miss the birthday celebrations. So sorry, Amy, Renee and John. They finally reached Florida, and Karen flew to California for her niece's wedding. Lee does not want to fly anywhere, so he remained in the RV in Florida. Then, the two RV Gypsies drove their RV to the Winnebago Factory in Iowa because they had an appointment there to get the slideouts fixed. (They originally had this scheduled for September 12, 2016 but when they got there, the factory had to make a part so the repair was rescheduled for August 1, 2017). The two RV Gypsies had to stay in a hotel until August 19th. After Iowa, the two RV Gypsies planned to drive their RV to Arizona to visit Lee's sister Patty, who is not feeling well. But the cost of the repairs made it impossible to go to Arizona, so they headed back to their permanent camping spot in Florida. They are so glad they do not have a house to worry about while traveling. Then the two RV Gypsies went to Tennessee and visited Lee's nephew and his family on their farm and really enjoyed their visit. Karen and Gabby got dressed in bee-suits and Karen learned a lot about bees and Goats walked on the car of the two RV Gypsies. Those adventures and more on site 20 on the 2017 USA map. However, due to Hurricane Irma going towards Florida, the two RV Gypsies were unable to go to Arizona as planned to visit Lee's sister Patty. Their A/C and their refrigerator both died and they had to hang loose and watch what the hurricane's path. In the meantime, they prayed for the safety of their family and friends in Florida and elsewhere in the path of Hurricane Irma. In 2016 & 2017, the two RV Gypsies had big expenses in RV repairs. But since they do not have a house or apartment, things like this have to be expected. Due to these circumstances, they stayed in their RV in Broward County, Florida for an extended time in 2018. All travel can be found by using the USA button above and choosing the map for the appropriate year. Life is an enormous book. To not travel is to read only the first page. 2016 quick summary: Eight times the two RV Gypsies had to put their RV in different repair shops and they still had problems. But they also had lots of fun in 2016, especially when three family members joined them in Alaska. Karen had a major ATV accident but she is fine. The two RV Gypsies then returned to their RV Park in Florida for the winter. All of this can be found under the USA button above / then choose the 2016 map. But first, be sure to check out all the information below on this page, much of it will be useful in navigating this very large website. Some special highlights are also noted below. 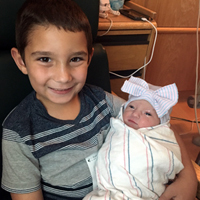 2016 - The two RV Gypsies proudly announced the birth of their great-granddaughter Gabriella Lee born in 2016. She will be worshipped by her brother Anthony Brian. September 7, 2015 The two RV Gypsies were in Ontonagon, Michigan and they went outside of their RV and saw The Northern Lights in the sky. They wanted to see them better so they drove just outside of town to get away from the city and lights and they drove down a road towards Lake Superior. It was a dead end road and there were four young guys watching the Northern Lights and they welcomed the two RV Gypsies to join them. It was like a dream come true; watching the Northern Lights and listening to the waves break on the shoreline of Lake Superior. 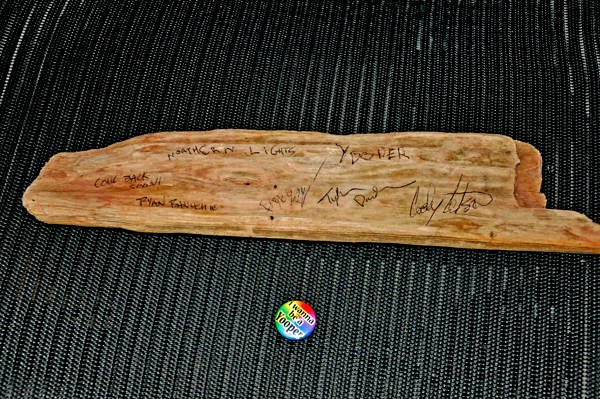 One of guys gave Karen a pin and another gave her two pieces of nice driftwood to burn incense on and they even signed the driftwood. 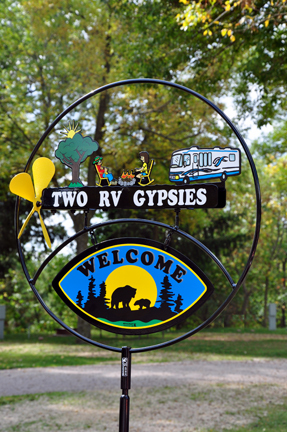 The two RV Gypsies hung the signed piece in their RV for all to see as they enter. What a special night the two RV Gypsies will remember forever. Photo below. October 19, 2014 - While at the Tybee Island Lighthouse in Georgia, the two RV Gypsies met some very nice people. After talking for awhile, the ladies asked Karen to post pictures of her Travel Tree on her website, so here they are. 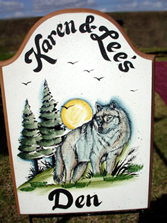 (Ladies, please use the guestbook button above and sign in so that Karen knows you visited her site. Thank you, we enjoyed talking with you. ) Obviously the travel ornaments cannot show up very well in the photos. Karen tries to buy something that hangs wherever she goes; something that says where they are, and often that is just a keychain. An update of the Christmas trees was posted December 2015. So far there are 122 keychains displayed on chains under upper cabinets, 121 travel ornaments on the big tree, 25 breakable travel ornaments on the wire tree, plus 85 patches displayed on six belts that hang around the RV. And the two RV Gypsies collect more and more ornaments, keychains, and patches each year. The USA, Canada, Alaska and TOC buttons above are the easiest ways to navigate this website! Always scroll to the bottom of every page for a new link or a flashback. It is important to adjust your monitor viewing size (instructions are posted below on this page, so scroll down). There is a lot of helpful information on how to find photos and navigate this website which can be reached by choosing the photos button above. Thank you for visiting and keep scrolling down this page. RVers should check the Links button above for more help in planning on buying an RV and travel. http://www.tripbuzz.com - They researched over 20,000 local communities across the U.S. to find and curate the most fun and interesting things to do in your area. A great site for travellers. If some photos don't show up on your computer, hit the F5 button, or view, refresh. That should solve the problem. Also, in the bottom right hand corner of your computer screen (or maybe the top right corner depending on your operating system and browser), put the size on 100%, 125%, (never bigger) to have the pages and photos fit your computer screen properly. If the photos or type do not align in a pleasant manner, this will help. a faster way of finding things on this very large website. The TOC button above, along with the Photo button above, should help everyone find what they are looking for faster and easier. This is a very large website, and there is so much information on this website, and so many places to explore. Have Fun! LOTS OF VIDEOS HAVE BEEN ADDED, AND THERE ARE MORE TO COME. USE THE TOC BUTTON ABOVE THEN CHOOSE MOVIES/VIDEOS TO VIEW THEM. Most times, campgrounds do not let the two RV Gypsies upload videos. The TV show "Under the Radar featuring Northern Crepes/Primitive Images" in Good Hart Michigan aired on Local WCMU stations Sunday August 11, 2013 at 6-6:30 p.m. and Southeast Michigan on DPTV Saturday August 10, 2013 - 10:30-11 am - The two RV Gypsies were filmed and hope they made it in the show, but so far they have not been able to get a copy of the show and they were not in the areas it was shown. How to find the thousands of photos and historical information on this website........get details by clicking on the "Photos" button at the top of this page. If you find any typos or errors on this website, please use the "E-mail Us" button above. And please remember to sign our guestbook. Thanks. If some photos don't show up on your computer, hit the F5 button, or view, refresh. That should solve the problem. Also, in the bottom right hand corner of your computer screen, put the size on 100%, or 125% never bigger to have the pages fit your computer screen properly. Being a full-time RVer is not the same thing as being a snowbird. A snowbird has a home or apartment somewhere in another state, and comes to South Florida to escape the cold, then leaves South Florida to go home. The two RV Gypsies have lived in Broward County since 1979 but they now live in their RV full-time and travel a lot in their RV. They always have their home with them, but they are not really AT HOME when travelling because they don't know the roads, location of stores etc. and don't stay very long in one place. Why on earth are people arguing with Karen and saying she is a snowbird, whether she likes it or not? There is nothing wrong with being a snowbird, but the two RV Gypsies just don't fit into that category. End of argument! Don't know why people want to turn this into an argument to begin with. RVing in a motorhome is exciting and full of adventure. Every day is a new experience for the two RV Gypsies. One day they will be hiking to a waterfall, the next day riding a Segway, or at a water park, or riding a roller coaster, or sitting on the edge of a cliff overlooking the valley below, or just relaxing with a cocktail at a seaside restaurant. One thing they seldom do, is sit around a campfire, unless their grandson visits them. Since the two RV Gypsies no longer have a house anywhere or any expensive belongings to worry about, life is just full of adventures. Note from the two RV Gypsies: May 7, 2012 The trial of Douglas Lively is over. The jury has ruled that Douglas is guilty of first degree murder of our son Brian Duquette. Douglas Lively got life in prison - no parole. Now we can forget about Douglas and just remember the good times with our son Brian. We will always love and miss Brian so much. The jury deliberated ONLY one hour and 10 minutes and much of that time was probably picking a foreman. Guess there was zero doubt. Maybe a record for a murder trial. After the jury was dismissed, they all sat in the courtroom to hear the sentencing. They don't have to do that and seldom do that, or so we were told. What a relief. Use the "Brian" button above for complete details/photos. We are thankful for many things even though nothing will bring Brian back to us. It just hurts so much how extremely violent the murder was. I still hate Douglas Lively and always will. So we got Justice for Brian, but there is no such thing as closure. Please don't use the word closure. Our hearts will always ache for Brian and the evil and pain he faced in the end. The two RV Gypsies want to hear from you through e-mail, and phone calls. If you have a RV travel website, please contact Karen so your website can be linked to this site and vice-versa. NO BUSINESS SITES PLEASE. I will only link to individual sites or blogs of RVers, or sites of personal friends.